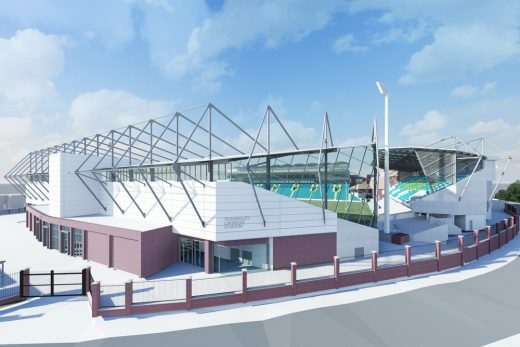 Leading structural engineering specialist TRP Consulting has been appointed to the team that will deliver the £40million redevelopment of Emerald Headingley Stadium in Leeds. 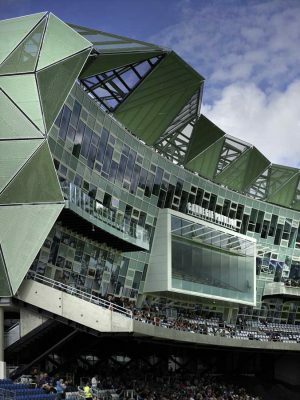 Alsop Sparch, a member of the global Ingenium Group of companies, has won a prestigious design excellence award for its design of the £20 million Carnegie Pavilion at Headingley cricket ground. Created for Leeds Metropolitan University, the 4,000 sq m Carnegie Pavilion is embedded within the historic Yorkshire County Cricket Club, located in the northwest quarter of Leeds, surrounded by serried rows of typical red brick terrace housing, but also large mature trees. On the north and west façade, the rainscreen cladding with its varied perforations, pitches and tones, visually break down the mass of the building, reflecting the light from a variety of angles. 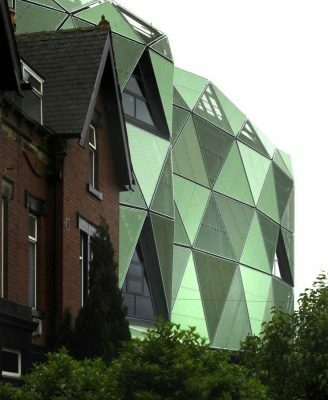 The naturalistic green cladding intentionally merges with the soft landscaping in front of the Pavilion as well as the existing mature trees along Kirkstall Lane and the surrounding neighbourhood. The three dimensional rainscreen façade is formed from discrete flat panels clad with regular strips of perforated, powder-coated aluminium, supported on a triangular metal subframe, spanning from floor slab to floor slab. It is itself punctuated by an irregular pattern of triangular windows. Alsop’s striking scheme The Carnegie Pavilion for Leeds Metropolitan University and The Yorkshire County Cricket Club started construction in Leeds this week. The 4,000 sq m project combines a new university teaching facility with new world-class cricket media and hospitality facilities to provide a unique integrated development. The scheme is due for completion in May 2010 following 16-month construction period. The Carnegie Pavilion will replace and upgrade the existing cricket facilities at Headingley Carnegie, whilst providing first class teaching space for Leeds Met. Alsop’s design creates a powerful verdant building that blends in well with its surroundings. The pavilion provides accommodation for a mix of uses on five floors for both clients while also respecting daylighting and privacy of the adjacent residential buildings, and connecting the green spaces around the pavilion with the locality. Plans include: a state-of-the-art media centre; an upgrade of player facilities such as changing rooms and treatment rooms; and replacement spectator seating, new executive boxes and associated facilities. The new hospitality suites and media centre have been designed as lecture theatres and teaching space for use outside major cricketing events. Planning consent has just been granted by Leeds County Council for a striking new scheme at Headingley Carnegie Cricket Ground designed by SMC Alsop for Leeds Metropolitan University and Yorkshire County Cricket Club. The 4,000sq m project combines new world-class cricket media and hospitality facilities with the functions of a University teaching faculty to provide a unique integrated development. The Carnegie Pavilion will replace and upgrade the existing Yorkshire County Cricket Club facilities at Headingley Carnegie Cricket Ground, whilst providing first class teaching space for Leeds Met. The scheme is scheduled to start construction later this year, and is due for completion in 2010. Leeds Metropolitan University and Yorkshire County Cricket Club have submitted plans for a striking new scheme at Headingley Carnegie Cricket Ground in Leeds. The scheme combines new world-class cricket media and hospitality facilities with the functions of a University teaching faculty to provide a unique integrated development. 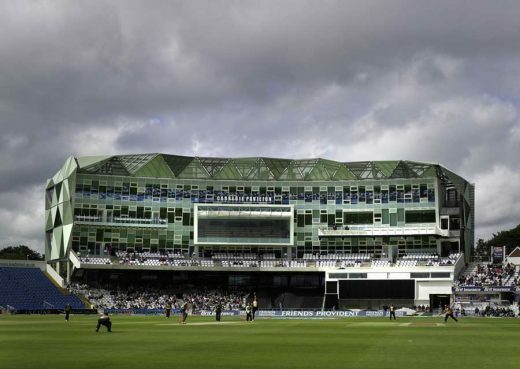 Designed by Will Alsop, the new 4,000sqm Carnegie Pavilion will replace and upgrade the existing Yorkshire County Cricket Club facilities at Headingley Carnegie Cricket Ground, whilst providing first class teaching space for Leeds Met. During the summer period, the proposal will operate mainly as a cricket pavilion and media centre, whilst during the academic year, the proposed development will operate mainly as a University teaching faculty, allowing students access to ‘real world’ modern media facilities, sporting, hospitality and event management experiences. Alsop’s response to the joint client brief and the physical constraints of the site, which is bounded on three sides, is to create a powerful verdant building that blends in well with its surroundings. The pavilion provides accommodation for a mix of uses on five floors for both clients – and the England and Wales Cricket Board’s (ECB) requirements for test matches – while also enhancing daylighting and privacy of the adjacent residential buildings, and connecting the green spaces around the pavilion with the locality. Plans include: a state-of-the-art media centre; an upgrade of player facilities such as changing rooms and treatment rooms; and replacement spectator seating, new executive boxes and associated facilities. The new hospitality suites and media centre have been designed as lecture theatres and teaching space for use outside major cricketing events. Environmental, economic and social sustainability are central to the project. The sustainability strategy involves creating one dual-use building which will be used all year around, and is designed to achieve an environmental assessment (BREEAM) rating of ‘Excellent’. Integrating successfully into its setting, the Alsop scheme presents a predominantly naturalistic green, white and glazed exterior featuring green rainscreen cladding with varied perforations, pitches and tones. The cladding strategy along with carefully considered landscaping elements aim to visually soften the edges and break down the mass of the pavilion. The naturalistic green cladding intentionally merges with gentle landscaping in front of the pavilion as well as the gardens and trees in and around the adjacent residential area. Echoing the curves of the stadium, the upper three floors of the pavilion are enclosed by facetted, triangular perforated, metal panels in three naturalistic light green tones. In contrast, the upper ground and lower ground floors are enclosed with frameless curtain walling to maximise the openness and transparency at entrance level. Above the third floor, the triangular metal panels reappear in the form of an overhanging roof shade to the glazed south elevation. Spanning floor to floor, the windows are subdivided into fixed and opening panels. As a visual counterpoint to the predominantly green elevation, the windows are tinted with purple tones. The east façade, which runs parallel to the existing boundary brick wall, will be clad entirely in white-painted timber forming a trellis for the green living wall to support climbing plants. At the eastern end of the site, which is closest to the residential neighbours, the green space will be extended to form a landscaped roof over the upper ground floor. In contrast, the south façade, above first floor level, is flat but inclined, enclosed by sheer curtain walling in an irregular, chequered pattern of translucent white and clear panels. The white panels enhance the insulation of the facade, reducing both heat loss and heat gain whilst maintaining adequate daylight levels for teaching areas. In integrating the pavilion with the surrounding neighbourhood, the proposal involves extending the green spaces around the building, removing a car park and demolishing the existing brick wall and replacing it with open railings. Stewart Regan, Chief Executive of Yorkshire County Cricket Club, comments: “In its current state, Headingley Carnegie Cricket Ground is facing the prospect of losing its Test Match venue status in an increasingly competitive market, particularly following the recent redevelopment of existing and new grounds such as The Oval (Surrey), The Rose Bowl (Hampshire), Trent Bridge (Nottinghamshire) and Sophia Gardens (Glamorgan)”. The economic benefits of retaining Test Match cricket at Headingley are significant. Hamish Robertshaw, Associated Director at DTZ explains: “It is estimated that each Test Match at Headingley Carnegie is worth some £3.5 million to the local economy, making an upgrade of facilities at the stadium vital. The innovative Carnegie Pavilion will offer a superior sporting venue and an inspiring real world taught experience for students of Leeds Met’s School of Tourism, Hospitality and Event Management”. Should planning approval be granted, the scheme is scheduled to start construction later this year following the conclusion of the 2008 cricket season, and is due for completion in 2010.